Apple trees are not indigenous to the Middle East. Thus, the fruit of the Tree of Knowledge of Good and Evil was unlikely to have been an apple. Genesis 3 might be referring to a pomegranate. Genesis 3 describes a story in the Garden of Eden. A common Protestant interpretation explains that, Satan, in the form of a snake, convinces Eve that God has lied to her and her partner Adam concerning the Tree of Knowledge of Good and Evil. He convinces her to eat the fruit of the tree so that they will become as gods. Adam later follows suit. This is often described as the fall of humanity, because the orthodox interpretation is that by this act, sin entered the world for the first time. With it, death appears for the first time. (The Church has taught that before this event, animals lived forever, and without bloodshed; there were no carnivores.) God cursed the snake, Adam, Eve and even the earth itself. In what is called "original sin." the transgression of Adam and Eve becomes imputed to all of the descendents of the original couple i.e. to the entire human race through over 200 generations to the present day. A massive gulf was created by Adam and Eve's disobedience which can only be bridged by the salvation offered by Jesus Christ's atoning execution by the occupying Roman army. The Roman Catholic Church deviates somewhat from the Protestant interpretation. They acknowledge that Genesis 3 is not a precise historical account of the events involving the Tree of Knowledge of Good and Evil. However, they teach that it is based on a historical event. It describes the rise, not the fall, of humanity. It portrays God as having created Adam and Eve as proto-humans. They were not fully human because they lacked a moral sense. This is now one of the main differences between humans and the rest of the animal world. The original couple had no concept of right or wrong. God deceived Adam and Eve into believing that the fruit of the tree was poisonous. A very intelligent and helpful animal, a snake, convinced Eve of the truth: that the fruit was not poisonous, but that she would gain knowledge of good and evil if she ate it. Since God had created the first parents with a curious nature and a drive to excel, both Eve and Adam were anxious to eat the fruit. They did indeed develop a moral sense for the first time. This was an attribute previously restricted to the gods. In a fit of rage, God cursed the snake, Adam, Eve and even the ground itself. Adam and Eve advanced from an animal-like status with no moral sense into full humanity. The snake told the truth -- that Adam and Eve would not die on the spot because of the allegedly poisonous fruit. Genesis is an allegory. It describes the process that every generation of humans goes through as they mature into adulthood. They are born into their family of origin, helpless, innocent, hopefully in an atmosphere of security. They blindly following the expectations of their parents. Their parents tend to their every need. Parents are viewed as gods by the newborn. When they become teens, they start to build up a head of steam. They question their parents, experience new levels of conflict within the family, develop their own goals and ethics, and finally leave their home to strike out on their own. Genesis is an allegory. It describes the transition of the human race from a state of innocence, where people lived as near-animals. They were initially unaware of their own mortality; they were driven by instincts and had little or no concept of right and wrong. They were nomadic hunters and gatherers who lived off the land. After the transition to full humanity, they had a moral sense. They realized that their life on earth was finite. They later settled down and became farmers. Part 1: Analysis of the text: Quotations, Overview, Assumptions, Authorship of Genesis 3. Part 3: More detailed analysis of Genesis 3:8-24. Background. Biblical references. Religions & faith groups that believe/don't believe in original sin. 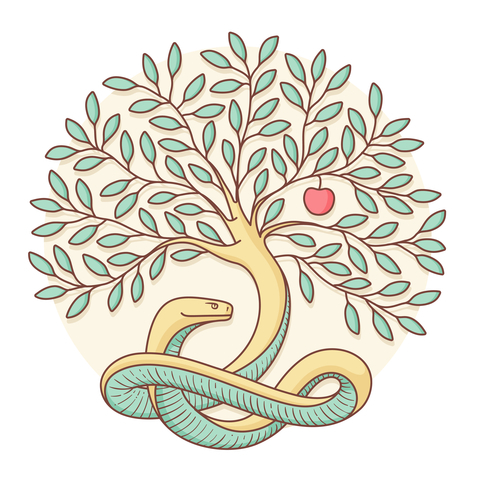 © Foxys Graphic | Dreamstime.com - Tree of the knowledge of good and evil with snake and apple. "Christianity and the fall," BBC, "Religion and Ethics," at: http://www.bbc.co.uk/ This essay has been archived, and is no longer being updated. However, it is still available to read. It is unlikely to need updating, because the two opinions by liberal and conservative Christians that it expresses are unlikely to change. "Catechism of the Catholic Church," Paragraph 390.